Posted by shawnpci in Fire Protection, Fire Systems, FSSA, NICET, Uncategorized. 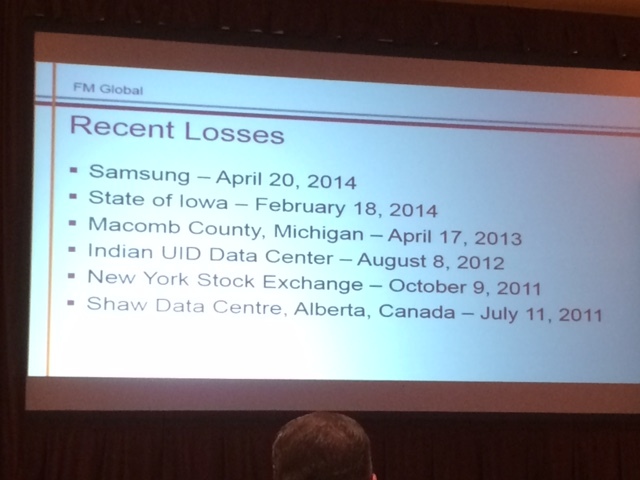 FM Global, a recognized leader in loss prevention services worldwide, presented Challenges of Data Center Fire Protection to the delegates attending the Fire Suppression Systems Association’s 33rd Annual Meeting in Clearwater, Florida. Robert Kasiski, a senior engineering specialist with FM Global, provided an engaging presentation of data center market statistics including total estimated worldwide data center floor space of over 286,000 square feet across over 509,000 centers. Additionally he noted that new technology and best-practices are increasing the need to be vigilant in providing proper fire protection coverage. Kasiski noted that lithium ion batteries are becoming more prevalent in UPS rooms that support data centers. These alone present issues to assuring adequate protection from fire. Another emerging challenge deals with the myriad cables throughout a center that present one of the signle largest combustible loads. He noted that the practice of “retire-in-place” for legacy cables only compounds issues. Noting that new server imersion technologies are being explored in data centers to mitigate cooling issues, Kasiski indiated this is an area of increasing research interest for his firm. Several video clips of FM Global fire tests were shown involving cables, cable trays and other combustibles. The results of these tests were of great interest to the delegates. The presentation concluded with Kasiski listing key issues going forward to be addressed not only by FM Global but the data center and fire protection communities including: understanding the consistency of change within a data center; identifying unrecognized hazards and accepting that current fire protection schemes may not meet the everchanging needs. The Annual Meeting continues through Tuesday, February 24th.